The Warner Point trail is located within the South Rim section of the Black Canyon of the Gunnison National Park. This short out and back hike, provides some of the best views of the areas surrounding the national park and the lower reaches of the Black Canyon. The trailhead is located at the turn around point at the end of Highway 347 which is the main road on the South Rim. Park rangers lead small tour groups on the Warner Point trail during certain times of the year. More information can be obtained at the South Rim Visitor Center or on their website. The Warner Point trail is a nature or interpretive trail with stopping points along the way were hikers can learn more about the plants and geology they are seeing. The extra information helps to enrich the parks visitors with a better understanding of the land and provide a more memorable experience. Warner Point is at the end of a ridge that connects it to the parking area. The trail passes through pinyon and juniper forests interspersed with sage and a variety of other bushes. There is only about a 20 foot difference in elevation between Warner Point and the trailhead but due to a saddle in the ridge the trail looses about 150 feet of altitude meaning that on an out and back hike you will experience about 300 feet of overall change. The trail is built very well with steps of stone and logs to make it easier for even the novice hiker to enjoy. There are several benches where you can rest for a moment and take in the views. Off in the distance to the south you can see the towering mass of Mt. Sneffels in the San Juan mountains that reaches a height of 14,150 feet. To give you an idea of how deep the Black Canyon is you could take all of that height above the treeline that is covered with snow and hide it within the depths of the canyon. Wildlife is plentiful within the park but at times you have to be watching for it. This picture is of a wild turkey but there are also Gunnison grouse, eagles, deer, elk, mountain lion, coyote and bear. Just before the trail comes to an end at the point there is a post with a plaque of information about the serviceberry bush. It is at this spot that inner canyon hikers, that were lucky enough to draw a permit, begin their descent into the canyon. 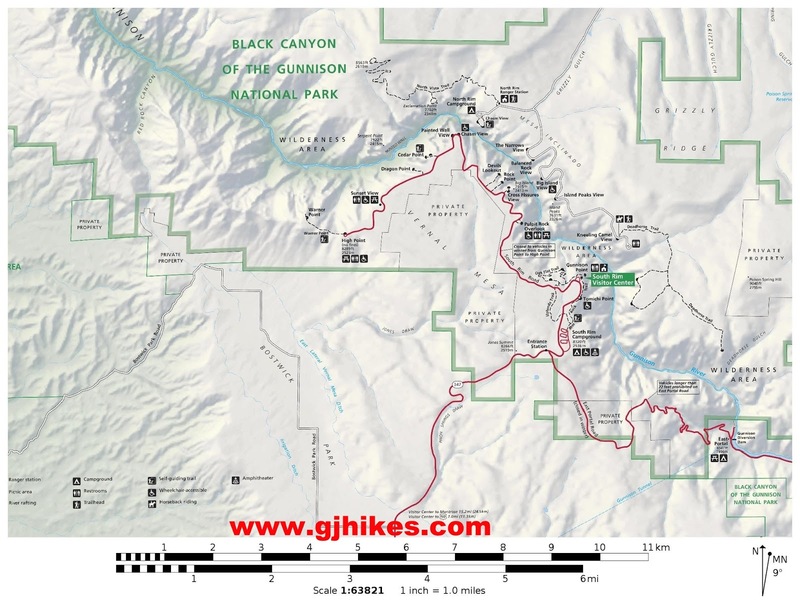 At this time this is the only inner canyon hike that uses a lottery system to limit the number of hikers. 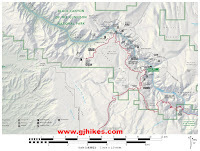 Permits for other inner canyon hikes can be obtained at the Visitor Center. Looking north from Warner Point toward the mouth of the Black Canyon you can see the town of Delta, Colorado in the distance with the Grand Mesa in the background. The walls of the canyon open up with a greater distance between the rims and the cliffs appear ever so ragged. In the other direction the Gunnison River can be seen flowing out of the narrows of the canyon. There are a large variety of wildflowers in the park such as these shortstyle bluebells. It is hard to pick a favorite hike out of the many trails in the Black Canyon of the Gunnison National Park but Warner Point is near the top of the list with its panoramic views and well built trail. Be sure to bring your sunscreen and a little water if you are visiting during the warmer months. If you would like to see it for yourself then all you have to do is 'Take a hike'.